Bloomsbury Sigma publishes Making the Monster: The Science Behind Mary Shelley’s Frankenstein to coincide with the 200th anniversary of the first publication of Frankenstein; or, The Modern Prometheus, one of the most influential and moral novels of all time. It is said to have single-handedly kick-started the genre of Science Fiction and, along with Bram Stoker’s Dracula, spawned more adaptations than any other book. This offering explores the background and influences of the masterpiece of fiction, referencing breakthroughs of the time. It is written by Kathryn Harkup, a professional chemist and author who splits her time between talks, demonstrations, and writing for The Guardian. She is the bestselling author of the mystery tale A Is For Arsenic. This is a very nicely presented hardback book with a striking red and black cover design depicting Doctor Frankenstein’s tools of the trade. This book is split into three parts – Part 1: Conception (Enlightenment, Development, Elopement, Nascent); Part 2: Creation (Education, Inspiration, Collection, Preservation, Construction, Electrification, Reanimation); Part 3: Birth (Life, Death). There is also an Epilogue, and a Timeline of Events. After an introductory overview of the book, I would have to say that the early sections are much more enjoyable. These read like a biography, telling a linear timeline of events from Mary’s origins and upbringing, her relationship with Shelley, through that fateful meeting of minds and the horror/ghost story competition, the reactions to her tale, and the ultimate publication of her ground-breaking book. But it also goes beyond this point. Although the background to the story is reasonably well-known, it is significantly more in-depth than we are accustomed to without ever becoming dull. For example, there was a real Castle Frankenstein. Although there is no evidence she visited the castle, Mary would have passed nearby on her travels and certainly heard the tales of illicit attempted experiments to transfer souls. The latter sections cover body science through the ages. It wasn’t just electricity and the power of sunlight/solar energy. Experimentation was the key here, much of it clandestine but without which we would be much more in the dark. Breakthroughs are explained, along with the problems surrounding them. Unorthodox methods were more common than anything authorised. But then tampering with the human body was at that time tantamount to playing God. This is a book of two halves, for the reasons I’ve just pointed out. 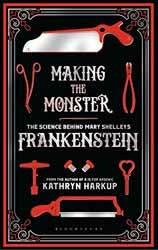 The science of Frankenstein takes a backseat to Mary Shelley’s story, so treat this as her biography and you won’t be disappointed. However, I don’t think casual horror fans will see much of interest inherent. Better that they just read Frankenstein; it’s an all-time classic which deserves to live forever.